Editor's note: Rachel Hoyer has joined Chris Barylick to offer some additional insights about the state of this year's E3 gaming conference in Los Angeles. She's an avid gamer, but a first time E3 attendee. With more than just a bit of sadistic glee, I am certain, Nintendo planned its E3 press conference for 9:00 AM PT on Tuesday morning, knowing full well that many journalists who hadn't slept much the night before would be lining up early to get a good seat. I was there at 7:15 and by 8:00 AM the auditorium was packed with about 1,500 press members, representing the full gamut of media. I'd just barely awakened, so it felt surreal to be subjected to the “nightclub” atmosphere of the event. Things got downright bizarre when Nintendo president Satoru Iwata revealed the Wii Vitality Sensor, but failed to explain how it would be used in Wii games. Coming inside from early morning Los Angeles sunshine, the press was greeted by a darkened auditorium with flashing strobes and blue lasers, several large screens onstage featuring Nintendo trivia, along with blaring upbeat music. I had the niggling sensation that I had been out all night and was now attending some sort of gaming-related afterparty. An afterparty where I sat and watched Nintendo play Quizzo for an hour and a half with 1,499 strangers. Nintendo is well-known for marching to the beat of a different drummer, zigging when the rest of the industry zags—enough so that analysts have occasionally compared Nintendo (favorably) to Apple as an industry leader that puts innovation ahead of what seems marketable at the time. That's paid huge dividends with the Wii and the DS, though Nintendo seems to have played a very conservative hand for this show. Talking points included the new Wii Motion Plus add-on, new games and follow up titles to popular existing games for both Wii and DS platforms. Then there was the oddball—the Wii Vitality Sensor. According to Cammie Dunaway, Nintendo executive vice president of sales and marketing, the Wii Motion Plus is an improvement in product design that will increase movement precision. Nothing too titillating there, though it's sure to be a welcome addition to gamers who feel that the standard Wii controller is too sloppy. Nintendo's crowd-pleasing president Reggie Fils-Aime showed it off, and told the crowd that "every mistake [they] make will be faithfully reflected in the game." How reassuring. The Wii Motion Plus is coming out in July. Nintendo had no new gaming platforms to talk about—the company is still firing on all cylinders with its Wii console and DSi handheld system. So it's little wonder, then, that Nintendo's presentation was strongest on games this year. Announcements about new ames like Golden Sun DS, Metroid: The Other M, and Super Mario Galaxy 2 garnered a loud and enthusiastic crowd response. Metroid got the biggest cheers, but the level of gameplay integration for the Wii platform wasn’t obvious from the trailer. Super Mario Galaxy 2 looked fresh, fun and well designed for the Wii—Nintendo has really perfected the art of the adventure game over the years and this one is a sure winner. If there’s one game I’m really looking to take for a test run, it’s Super Mario Galaxy 2. 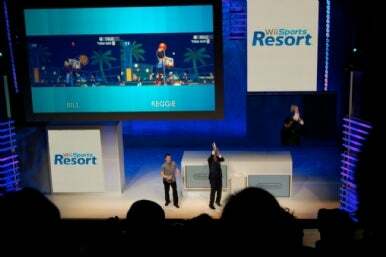 Wii Sports Resort is one of many new games coming out for the Nintendo Wii. Other strong featured titles included Wii Fit Plus, Wii Sport Resort, The Conduit, Resident Evil: Darkside Chronicles, Dead Space Extradition, Red Steel 2, Final Fantasy: The Crystal Bearers, Kingdom Hearts: 358/2, COP: The Recruit DS, Style Savvy DS, and Mario vs. Donkey Kong DIY DSi. Gamers will be familiar with most of these titles and what to expect from them. Two games that had people scratching their heads were Mario and Luigi: Bowser’s Inside Story—an RPG that takes place inside the body of Mario's famed adversary Bowser—and Women’s Murder Club: Games of Passion, a detective game enigmatically targeted at women aged 40 and up. The real mystery is the announcement of Nintendo’s enigmatic new product: The Wii Vitality Sensor. Nobody seemed to know what it does, including Saturo Iwata, Nintendo's president, who was presenting the product. The Vitality Sensor is a finger cuff that measures your own biometric data. Applicability seems limited at best. Nintendo did not mention a single use for this new device, although “Ch'i” and relaxation were used as product buzzwords. Most telling of all were the audience snickers and whispering that accompanied this presentation. Perhaps Nintendo could expand market demand by installing a glucose meter and a blood pressure monitor? Hopefully, the Nintendo booth representatives will be able to provide a less perplexing product description.